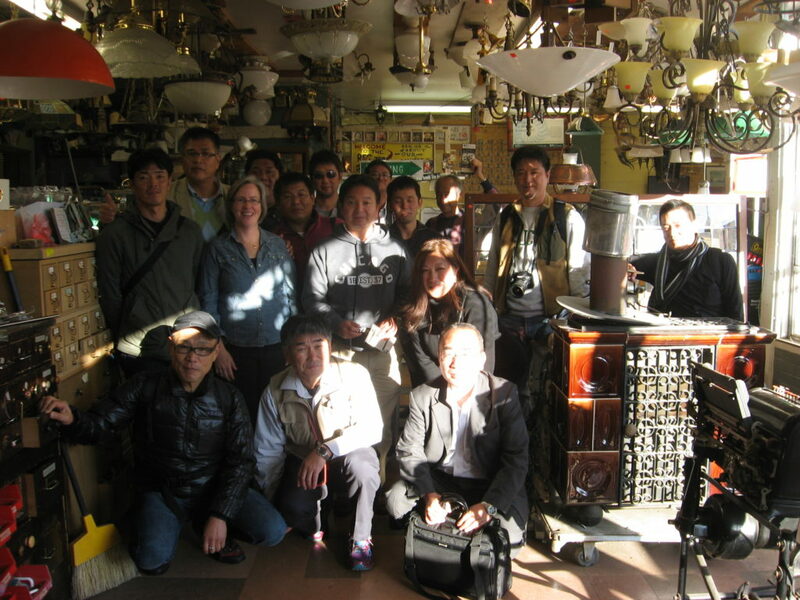 The RE Store in Seattle hosted a group of Builders, Developers, and Architects from Japan this week. They came to the states to attend the National Association of Home Builders (NAHB) Remodeler’s Show in Chicago, and had a two day stop in Seattle to see a couple of projects, and visit a salvage company – choosing us for their trip! A very curious group, with many questions about our being a nonprofit, our business model in general, building size, where we get the materials (donated by all of you wonderful people!) and how we go about pricing our materials (nothing too fancy, but definitely a heady mix of understanding industry standards and materials, historical precedent, and just plain ol’ experience). Several of them went away with some small antique-like token – a door knob here, drawer pulls there – one gentleman couldn’t leave without taking a sizable female-shaped sculptural piece for his garden back home! We had a great time swapping stories with them, and got a few of them excited about starting a salvage business back home. Thanks so much to Nariko Kawashima of Abodian Cabinetry, for setting this up with us and translating!